MP4 to FLV Converter is the best video-converting software to convert video and audio files from one format to another without damaging your original files. But you can get to know what the advantage of MP4 to FLV Converter is. Right! This software is skilled in converting MP4 file to FLV format. It supports all video and audio formats, over 160 plus formats supported high quality! Just three steps you can make your dream come true. Are you curious how to convert a MP4 file to MPEG, do you want to have a try? 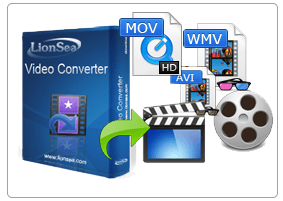 Lionsea.com gives you a chance as it launched a new freeware which is called MP4 to FLV Converter. This one is expert in how to convert a file from MP4 to MPEG. So this issue can not bother you any more. MP4 to FLV Converter must be the perfect and best helper. Step 1: Preparation for Lionsea MP4 to FLV Converter. Step 2: Select Encoding Profile. Step3: Convert MP4 to MPEG as you want. For Video: TIVO, AVI, MP4, MPG, MPEG, NUT, H.264, NSV, VOB, MOV, FLV, MKV, MTS/M2TS/TS/TP/TRP, MOD, TOD, DV, WMV, ASF, 3GP, 3G2, DRM MP4, RM, RMVB etc. iPod , iPod touch 4 iPhone, iPhone 3G, iPhone 3GS, iPhone 4, iPhone 4S, iPhone 5, iPad, iPad2, New iPad, iPad 4, Apple TV PSP, PS3 Xbox, Xbox 360 General mobile phone, BlackBerry, etc. General MP4 players: Archos, Creative Zen, iRiver, etc. Windows Mobile devices: Pocket PC, Dell Axim X51, HP iPaq hw6500 series, etc. Google phones: Nexus One, HTC Hero, HTC G2 Magic, HTC Tattoo, Motorola Droid2, Motorola CLIQ, SamSung i7500 Windows Phone 7: HTC Surround etc.